GTA V is also the biggest success and the most popular so that should tell you something. If RDR2 is such a wonderful game why do I even hear people saying they liked the first one but don't like this one? Some people liked GTA IV better than GTA V, so that dosen't tell us anything and RDR 2 as you say it is just as wonderful game as GTA V and you will always hear people say they didn't like the game no matter which game it is, a game developer can't please everybody, it's simply impossible. Yes but people tend to not want that from Rockstar. They are a company that built their brand on balls to the wall fun and chaos and starting with the HD generation they all of a sudden change that up and nobody is supposed to have a problem with it? What do you know about what people want? You say you Google search ”RDR2 boring” and that there’s a lot of negative stuff. Wow, what a surprise. Try searching for ”RDR2 masterpiece” instead and let’s discuss that? I have several friends whom I’ve met through GTAO who didn’t know what to expect from this game, and they love it, even though they’re used to GTAO. And the ”balls to the wall” fun you’re talking about... well, yeah I guess people want that (and there’s plenty of it in RDR2 as well), but would the GTA series be the same without those moments when you’re parking your car somewhere in the rain and just listen to the talk radio? R* have always been about immersion. Evidently a lot of people love this game, and from what I can tell most are very happy with the approach R* took. I’m glad that R* expanded upon RDR1 and gave us more of what made the first game so good. There are different opinions of course, there always is. We need more diversity in gaming, and I’m real glad that R* had the balls to make this game what it is. If you want something more easily accessible, just play any other AAA game. I agree but most of the gaming world just wants pick and up play fun. As someone who grew up pre-video games, I remember coming home from school and my brother and I plugging in Pong and playing for an hour or two. It was only one game, but the idea that we could just turn on the television, switch on the game box, and press "Start" and off we went, was everything. Later, when games became more advanced, games like Myst required players to invest a ton of time and patience between solving ridiculous puzzles to advance the story and often excruciating load times. But, now, those load times are nothing – nothing – compared to the time I spend firing up the XB1, loading a game, getting online, and actually playing. Even single player games are a nightmare in comparison to the "old" days of gaming. Frankly, I miss going to the bowling alley with a pocketful of quarters and going from Pac Man to Defender to Asteroids to Centipede to Omega Man and back to Pac Man, all afternoon until the money ran out. I'm not even playing RDR2 right now, because honestly – I just don't have that kind of time between work, family, house, and life. Yes, it tells me that popularity and quality are very different things. But I've seen that lesson before plenty of other places. Many more people watched Two and a Half Men than The Wire. Many more people watch the Fast & the Furious movies than The Godfather movies. Rockstar have made so much money that they can now make the game they want to make, and that they think is as good as they can make, rather than aim for the lowest common denominator. And that's what they've been doing for over a decade now. And my personal view is that, in RDR2, they have succeeded triumphantly (despite the occasional misstep). And I don't really care if a few loud people on this and other internet forums disagree! No thank you, I'm not playing those games and with Ubisoft games, if you have played one open world Ubisoft game, you feel you have played them all, Far Cry vibe in Ghost Recon Wildlands and in Assassin Creed Origins. Ubisoft games leave a lot to be desired in the story department but the gameplay is loads more fun. It feels very fast and fluid. It doesn't feel like you are controlling a walking tank. Indeed, pre-video games, millions of kids spent their after-school hours into the late night, from junior high through college, playing strategy games, military board games, D&D, and so on. The level of patience, and the type of concentration, and the parts of the brain gamers used then, compared to now, are almost mutually exclusive. There are still gamers who like the Civilization type games, versus the gamers who just like to blow sh*t up. The communities are so different, it's hardly possible to compare them like @woggleman is trying to do in some of his arguments. It's like how games like Candy Crush are lumped into the same category, "video games." as real time 3D shooters. Come on, now. That really grinds my gears. They really don’t...Its sold more than both and received better reviews. Why do they need to exactly tell me? When were you elected Global Gamer Representative? That is a very prestigious position that allows you to speak for every single gamer ever. Also, most of the people complaining about this game weren't alive* (or were just being born) when Rockstar went HD, and that happened 17 years ago, so let's not pretend that this was an all of sudden change. *This is based off ~5 years on this forum and listening to the complaints about GTA V. For many who preferred GTA IV, it was the first one they played and as result, their starting point as to what the franchise should be. It doesn't feel like you are controlling a walking tank. RDR 2 dosen't feel like that either. I'm not sure what you mean by fast, and how this has anything to do with a game being a good game or not. I'm glad I can take my time in RDR 2, no rush is perfect for me, maybe that's why I had problems with killing 3 enemies with a throwing knife in 10 sec and had to retry duels over and over, I don't like fast paced games. The V forum had five years of constant negative feedback but I give some honest reality about this game and I am a problem? but I give some honest reality about this game and I am a problem? The problem is that you say people, not some people, but you seem to talk for all of them, that's the problem and it's not a reality everybody shares, it's your reality and you should say "in my opinion" and not give the impression that you are talking for everybody, that's my opinion. YOUR honest reality, not mine. You don’t speak for me. And honest reality would be giving credit where credit is due... something I’ve yet to see you do. I can’t find a single post where you praise anything about the game. That’s why people think you’re trolling. Even critics that are paid to criticize give positive points. You. Nothing. RDR2 isn’t changing. Enough people love it that it will continue on, regardless what you or your friend thinks. If you don’t like it, play something else. He sure in the hell don't speak for me. No one would have any issues with you if you simply state you don't like the game for X/Y/Z reason. I loved the game but I don't think it's completely faultless, nor am I perplexed at the idea that somebody doesn't enjoy it. The issue however is that you seem to keep hiding your opinion under the guise of things like "many people I've seen on forums say X" etc, which as many have pointed out is not at all true. Then instead of conceding or moving on from that topic, you keep trying to beat it into peoples heads that no, many people do hate the game. 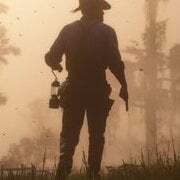 Hell, there are now three active threads about RDR2 being disliked in some fashion or another and the main reason for the activity in those three threads is because of you. Move on, man. Oh yeah. They’re making billions, maybe they should listen to you and they’ll make trillions. I admit the game is beautiful looking so I do praise something about it but it should be a movie and not a game. How can it be a great game if the gameplay is bad? That is like a restaurant that is impeccably decorated but has bad food. Gameplay is bad for you, COD kid. I only tried COD once in my life. How can it be a great game if the gameplay is bad? Because they gameplay isn't bad for everybody I guess, not for me at least, I have played this game every day since launch, for me RDR 2 is a great game. It’s trolling. Let him troll and ignore him. Please, man! We’re a whole bunch here saying WE LIKE THE GAMEPLAY. You just gave us two examples of games that you prefer. What is the problem? Not everything they do is built on arcadey balls to the wall fun. RDR1 wasn't. They've always treated their various franchises seriously, they don't look at them as simply "GTA in the _____". Also they haven't changed how their games play and feel since IV yet they still continue to break records at launch so no, people don't have a problem with it. You go on about the backlash of IV but if people hated it that much RDR1, GTA V and RDR2 would have been very different, but they're not. As far as the realism and survival aspects go they promoted both heavily and made it a point to talk about them in interviews. Hell, the survival aspect is no different to Minecraft's (having to eat regularly to maintain your health regen). That's the 2nd best best selling game of all time, which had over 90 million players last month. The idea that "many people" expected GTA in the wild west isn't rally the case at all either, like I said they promoted both aspects well. There will have been some uninformed people sure, but lets not pretend like it was anything close to being able to implied it was a majority or anything remotely close. Well RDR is a different franchise but I'm not sure how you can't see how different GTA V is from IV? The physics were dumbed down, the driving was more arcadey, the story was over the top and lighthearted instead of dark and serious, every second mission was some action blockbuster instead of taking it slow etc. Absolutely, but the core gameplay and controls (the input "delay" when moving, lock on aiming etc) are still very much based on what they did with IV and RDR. Popular ideas and gameplay mechanics jump from genre to genre, always have and always will. The point I was making that Minecraft is a slow paced game with survival aspects and is hugely popular. It contradicts the theory that "many people" do not like realistic games with survival mechanics. You also have the survival games that have blown up on PC in recent years like Rust, DayZ etc. Wtf dude, the gameplay isn't bad. I agree to an extent that many aren't liking the slow realistic stuff of the game but it seems you have read so much that you actually think the gameplay of RDR2 is bad. It's not, it's lots of fun and I love that not every mission is some action blockbuster and that it's not cartoony sh*t like Odyssey where nothing about the game world and character feels real. Something else I have seen some criticism about is how "linear" the main missions are but I like that too since it allows for more memorable missions and moments, in games like FC5 it all feels so generic because of the "choose your own approach". I actually loved the gameplay until I started reading things online about it. It's especially not bad since you can drastically reduce the sluggishness in the settings menu. The default controls are not the ideal.